Radio King Orchestra® (RKO) has "swung" into the big band arena with a fresh new sound which continues to dazzle audiences and bring them to standing ovations at such venues as The Kennedy Center New Year's Eve Gala,The Kennedy Center Concert Hall, Millennium Stage, and Carter Barron Amphitheatre. Most recently, RKO has appeared on an episode of NBC's, The West Wing. In addition to an extraordinary musical performance, RKO encompasses the sophistication yet carefree nature of the cherished RatPack. Comprised of the finest musicians in the Washington metropolitan area, Radio King Orchestra® creates an enchanting evening of entertainment, as they work their way through the repertoire of Frank Sinatra, Dean Martin, Ella Fitzgerald, Glenn Miller, Benny Goodman, and Bobby Darin, to name a few. They embrace all musical styles with a passion that entices the "listener" to become the "dancer" which makes this group the perfect package for any wedding or private event. Rick Gordon, one of the areas finest lead trumpet players and knowledgeable big band enthusiasts, leads RKO. With Rick's phrasing and bold commanding tone, the band has a drive that excites the room from the very first note. His credentials range from playing in pit orchestras of touring Broadway musicals to playing lead trumpet in Washington and Baltimore area big bands. Tom Barrick sets the band swinging with his exciting artistry on the drums. His astonishing drumming technique and energy is most certainly comparable to Gene Krupa and Buddy Rich. His exceptional knowledge of tempos is sure to please any dancer and the alluring rhythms he produces are compelling forces that will not allow one to sit still. 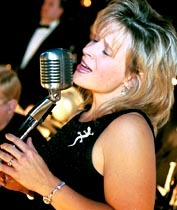 Robin Gordon, will keep you under her spell as she croons lovely melodies with passion and sensuality. The audience cannot get enough of her angelic yet sensual tones as she works her magic throughout the room. Her energy will entice dancers to show off their moves while her divine interpretations of love ballads will cause many a relationship to warm on the dance floor.